Avocado and sweet potato are a match made in heaven, don’t you think? I sure do and the two are matched up perfectly in these vegan sweet potato buddha bowls with lentils, avocado, red cabbage, sprouts, hummus, spinach, lemon tahini sauce and cilantro. These bowls are high in protein, high in fibre, gluten-free and vegan. Whole grains, legumes and/or starchy veggies. For the base and main substance of a buddha bowl I like to use a whole grain such as quinoa or brown rice, legumes such as black beans or lentils and/or a starchy veggie such as sweet potato or butternut squash. You can mix and match, say using a whole grain and a legume, or a legume and a starchy veggie. The point is to add some complex carbs to build the base of your meal. Today we’re using oven roasted sweet potato wedges and lentils. Greens. I like adding a handful of greens such as kale, spinach or arugula. This buddha bowl features spinach but you can use any greens you like. Dark leafy greens add a lot of nutrition and volume without adding excess calories. Raw or cooked veggies. Now the fun part: add in your favourite raw or cooked veggies, anything and everything goes! You can do zucchini noodles, grated carrot, grated beet, sprouts, chopped cabbage, roasted brussel sprouts, diced cucumber. There are no rules, making buddha bowls a great way to use up veggies and reduce food waste. Herbs. I usually like to add some fresh herbs for flavour and nutrients. I used cilantro in this bowl but chives, dill, parsley and basil would also work. Fermented foods. 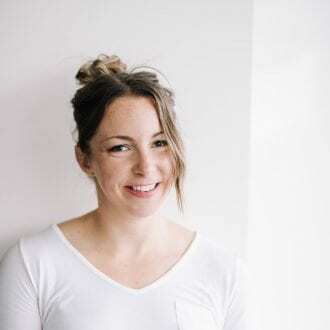 For gut health, tanginess, flavour and texture, try adding fermented foods such as sauerkraut, pickled veggies, tempeh or using miso in a sauce. Sauces and spreads. Every good buddha bowl’s gotta have a good sauce. This one has both hummus and a drizzle of lemon tahini sauce. I usually go with a tahini-based sauce but depending on the bowl you could use pesto, chimmichuri, chipotle sauce, spicy mayo, balsamic vinaigrette, pad thai sauce, coconut peanut sauce or any other sauce you like. Crunch and texture. To finish off your buddha bowl, try adding some nuts, seeds or roasted chickpeas from crunch. Almonds, cashews, sunflower seeds, pumpkin seeds, hemp seeds and walnuts all make great choices. This salad has a lot of good stuff going on. Let’s just take a quick look at the main nutritional highlights of each ingredient. Sweet Potato. My favourite source of healthy and energizing complex carbohydrates, sweet potatoes are an excellent source of vitamin A (in the form of beta-carotone) and a good source of vitamin C, manganese, copper, B6 and potassium. They’re also rich in fibre and contain niacin, vitamin B1, vitamin B2 and phosphorus, all of which work together to help keep your body functioning at its best. Spinach. One of the most potent disease-fighting foods you can eat, spinach adds antioxidants, iron, vitamin K, vitamin A, folate and magnesium. Iron plays a key roll in the function of red blood cells, which help in transport oxygen around the body, in energy production and in DNA synthesis. Sprouts. The vitamin and mineral content of different types of sprouts will vary but in general, the sprouting process increases nutrient levels of essential nutrients such as folate, magnesium, phosphorus, manganese and vitamins C and K. I use broccoli sprouts in this recipe but you can use any kind of fresh sprouts from the store or home-sprouted. Avocado. Avocado is rich in potassium and a good source of vitamin E, vitamin B, fibre and essential fatty acids. The oleic and linoleic acids found in avocados may help lower cholesterol levels, they phytochemical content protects the eyes as we age, they provide a quarter of your daily vitamin K, an essential nutrient for bone health and their fibre content make them great for digestion, reducing hunger and managing blood sugar levels. Hummus. Hummus is made from chickpeas which contain protein, fibre, folate, magnesium, iron and manganese. Tahini. I love tahini (sesame seeds) for it’s calcium content. Including tahini and sesame seeds in your diet on a regular basis is a good way to up your calcium intake. Cilantro. Fresh herbs are powerful stuff. I think we forget how many health benefits they have sometimes and just think of them as garnish but cilantro is rich in vitamins, minerals, phytonutrients, flavonoids, and phenolic compounds which can help do everything from lower blood sugar levels, to protect against cardiovascular disease to prevent disease. I used cilantro but you can use parsley, chives, basil or dill as an alternative. Cabbage. Red cabbage is rich in antioxidants, including polyphenols and sulphur compounds, which help protect the body from free-radicals and reduce the risk of cancer. They’re also high in vitamin C and vitamin K and contain folate, manganese, B6, calcium and potassium. It’s high vitamin C content is of note for disease prevention as this potent antioxidant may help protect against heart disease and certain cancers. The anthocyanins that give purple cabbage its beautiful colour have been linked to a reduced risk of heart disease and its potassium content may help lower blood pressure. It’s also rich in fibre which can improve digestion and help lower cholesterol. Lentils. The lentils add protein and fibre. A diet rich in dietary fibre has been shown to help reduce cholesterol, improve digestion, promote healthy blood sugar levels and support a healthy heart. Lentils are also rich in magnesium and iron. The more you learn about the nutritional benefits of plant foods, the easier it is to eat more of them, don’t you think? I love thinking about all the good stuff I’m eating and how it will benefit me. 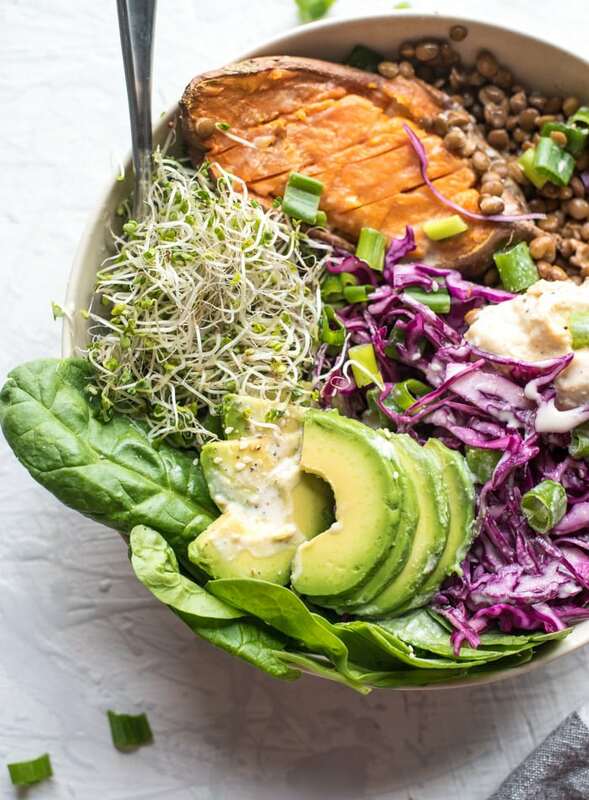 These delicious, healthy and filling sweet potato buddha bowls are made with oven roasted sweet potato, a quick red cabbage slaw, sprouts, hummus, lentils, spinach, lemon tahini sauce, cilantro and avocado. So much goodness!! 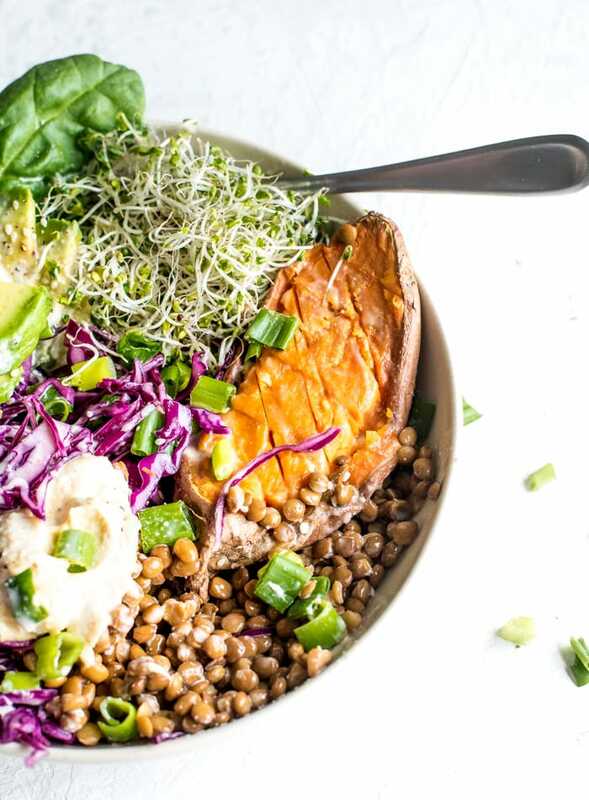 You can make this bowl for meal prep by making the sweet potato, tahini sauce and lentils in advance so all you have to do is assemble the bowls. For ease, I used a store-bought hummus in this recipe but you could try my kale hummus, beet hummus, roasted carrot hummus, roasted garlic hummus or roasted red pepper hummus for a homemade option. Using store-bought hummus and canned lentils definitely speeds things up. While I usually make my own hummus and lentils, sometimes it’s nice to have a fast, easy option on hand. 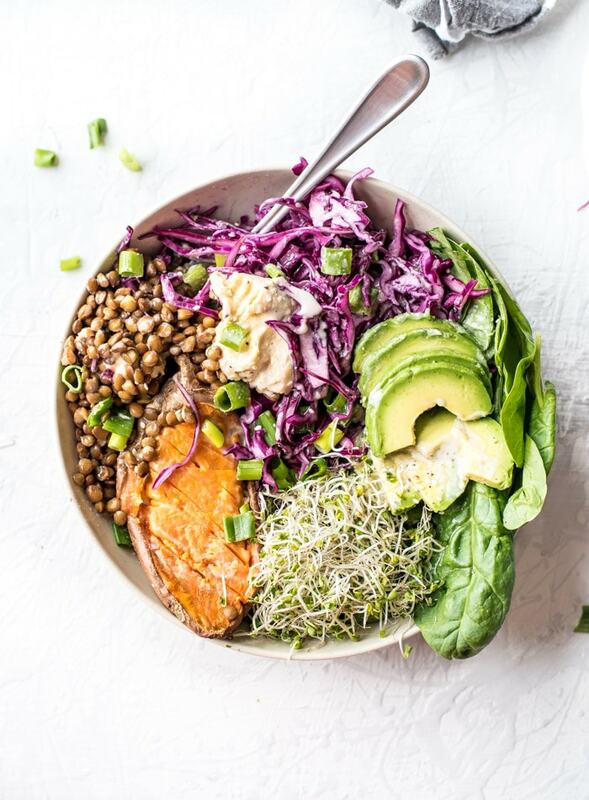 To make the buddha bowl, all you need to do is pop the sweet potato in the oven, get some lentils going on the stovetop (or use canned lentils like I did), mix up the lemon tahini sauce and then assemble everything once the lentils and sweet potato are cooked. These bowls taste amazing, are full of flavour, texture and nutrition and they just look so pretty…almost too pretty to eat…but not quite. Quick note on the red cabbage. For best results, use a mandolin slicer and toss the finely chopped cabbage with a bit of vinegar, salt and sugar and let sit for 15-20 minutes. You can totally skip this if you like but it helps make it more of a slaw than just plain, raw cabbage. I can never slice cabbage thin enough without a mandolin but if you don’t have one, that’s fine, just get it as thin you can. Mandolin’s are cheap and a handy tool to have in your kitchen. You can grab one on Amazon here. 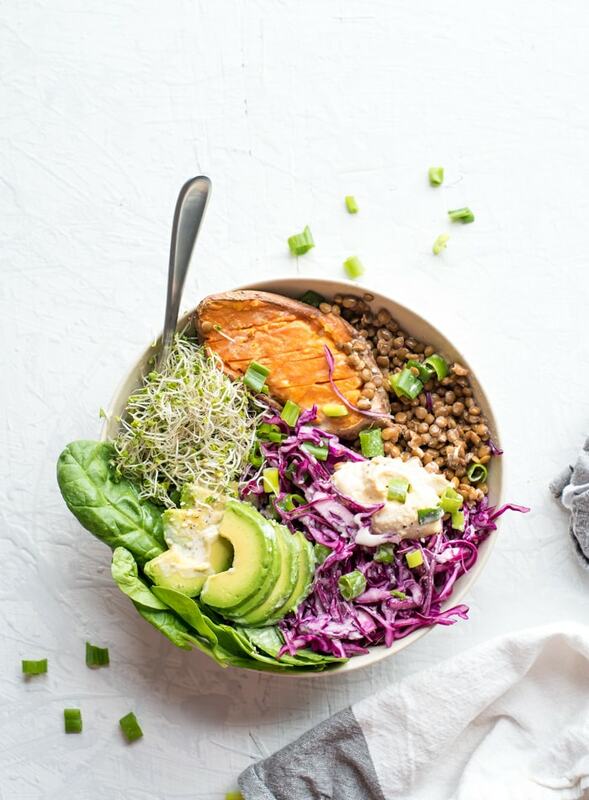 If you follow the amounts I used, one serving of this buddha bowl contains 525 calories with 65 grams of carbohydrates, 25 grams of fat, 18 grams of protein and 20 grams of dietary fibre. You’ll also be getting 25% of your daily calcium, 48% of your daily iron and more than your daily vitamin C and vitamin A. It’s also rich in antioxidants and a range of other essential vitamins and minerals. You can easily reduce the fat and carbs in this recipe by using less avocado, a smaller sweet potato and a smaller portion of lentils. I used half an avocado, or 60 grams and half a small sweet potato, or 125 grams and 1/2 cup of cooked lentils. To reduce the calories, use 1/4 of an avocado, 1/4 of a baked sweet potato and 1/3 cup cooked lentils. 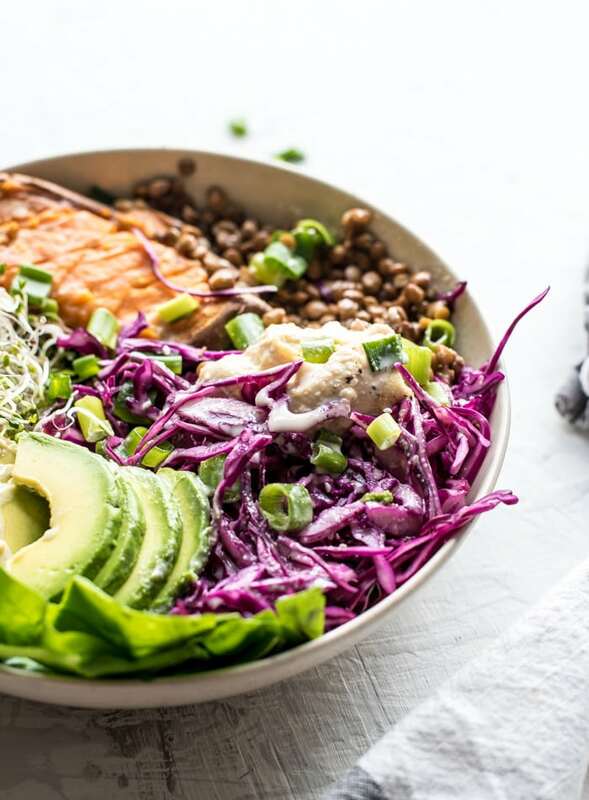 These beautiful buddha bowls feature perfectly roasted sweet potato, creamy avocado, red cabbage and sprouts plus hummus and lemon tahini sauce. They’re full of flavour, packed with nutrition and can be customized as needed depending on what you have on hand. To make the lemon tahini sauce, whisk the sauce ingredients together in a bowl until smooth and creamy. To make the red cabbage slaw, slice the red cabbage with a mandolin, place the finely chopped cabbage in a bowl, add the vinegar, sugar and salt, toss and let sit for 20 minutes or so to soften and add flavour. This is optional but it make it more like a slaw than just plain, raw red cabbage. To make the roasted sweet potato, pre-heat the oven to 425 F. Cut the sweet potatoes in half length-wise and place face down on a baking sheet that’s either sprayed with non-stick cooking spray or lined with a silicone baking mat. Bake for 30-40 minutes until browned on the bottom and tender. Once they’re cooked, slice and sprinkle with a little salt and pepper. To assemble the bowls, add 1/2 a sweet potato and a big scoop of the cabbage slaw to each then add the rest of the ingredients and drizzle with the lemon tahini sauce. The lemon tahini sauce and cabbage make enough for 4 large bowls or 6 smaller ones. Adjust the rest of the bowl ingredients accordingly or to your preference, it doesn’t have to be exact. My kind of dinner! We make buddha bowls at least twice a week. They are a great way to use up odds and ends. Love the apple addition in this one. I’ve never done that and I can imagine the sweetness and crisp texture are lovely with the other ingredients. YESSS I love Buddha bowls! What a hearty combo of black beans, quinoa and butternut squash! And that tahini lime dressing – so tasty!! I’ve been looking for healthy dinners lately and this one sounds delicious. Thank you!!! Yummy! I’ve really been into bowls lately and this one is perfect! My brother brought me a few butternut squashes from his garden! P.S. I couldn’t rate this recipe for some reason. Just wanted to pop in to say I love this recipe (my very first Buddha bowl!). It’s so quick to prepare and so filling! I’m going to explore the rest of your awesome site!